We have said it before and we’ll say it again: IT organizations around the globe are investing time and resources into public clouds, but there are still a lot of show-stoppers that make cloud-adoption less frequent than most people believe. Veeam has continued working on innovative solutions to bring added value to customers, including enabling service providers, and Veeam resellers that want to become service providers, with easy-to-use and affordable Veeam-powered backup services solutions. Becoming a service provider isn’t that easy. In many cases, there are a lot of valid reasons why this business model isn’t adopted. Lack of resources, billing methods, infrastructure and experience are the most cited ones. Our goal for Veeam Managed Backup Portal for Service Providers is to overcome these issues and deliver a solution that can be used for billing, tenant (client) management, remote monitoring, remote management and more without the hassle of a VPN connection. Veeam Managed Backup Portal for Service Providers is specifically built to overcome these issues and streamlines the service providers’ delivery of Veeam-powered backup services (including BaaS), including resellers interested in launching a service-provider business. By integrating with Veeam Cloud Connect for Service Providers, as well as being available in the Microsoft Azure Marketplace, Veeam Managed Backup Portal for Service Providers delivers the means to build new revenue streams. It also offers added value to your customers. Resellers and service providers already have extensive knowledge of Veeam and Veeam Backup & Replication, now they can monetize that expertise! Register for updates! 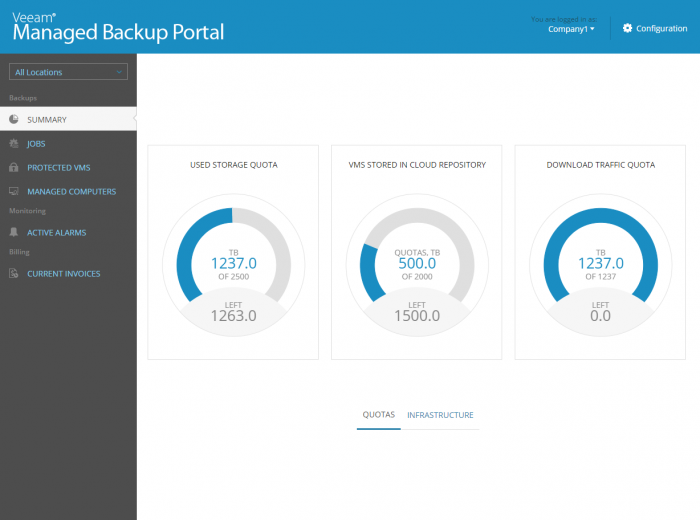 You’ll be the first to know when Veeam Managed Backup Portal is available. Veeam Managed Backup Portal for Service Providers is comprised of two components: your Cloud Connect infrastructure and the web-based, multi-tenant portal. The portal itself has two views: the service provider view and the customer view. Onboarding new users can be done easily through a simple wizard within the customer portal where tenant administrators can create other users and give them access to their view. One of the biggest challenges for the service provider is billing. Instead of the need to integrate different solutions together, or to do it manually with Excel, Veeam has included this out-of-the box function for you. Common scenarios, such as portal branding with a theme color and custom logos are supported. In addition, billing or invoice scheduling, alarms management to fine-tune alerts and subscription plans for your tenants can all be tweaked and fine-tuned to support your specific business model. 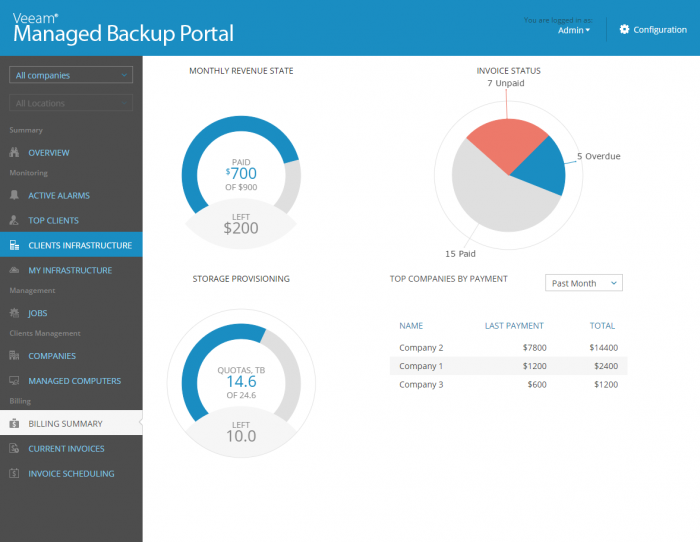 Daily management of your customer’s backups can be a piece of cake. With complete visibility into the environment and no need for a VPN (everything is done over a secure channel), your IT engineers will have more time and resources to do what they need to do, which is managing the customer backup environment and pro-actively solving issues. The service provider can view everything in their entire portfolio, as well as drill down into specific tenants, alarms, jobs or infrastructure components. Downloading the logs, starting, retrying or stopping jobs all give the service provider the capability of successfully managing and monitoring the customer environment. Customers or tenants have their own portal. Branded with the service providers’ company logo, the service provider has the ability to create their own users, with basic self-service monitoring and configuration available at their fingertips. Service providers can quickly look at their current usage, how many VMs (virtual machines) are stored in your environment and how much of their quota has already being used. They also get an overview of how well their environment is protected and how ready it is to cope with a potential disaster. Of course, the tenant can easily see all of his own protected VMs with lots of details such as the amount of restore points available. 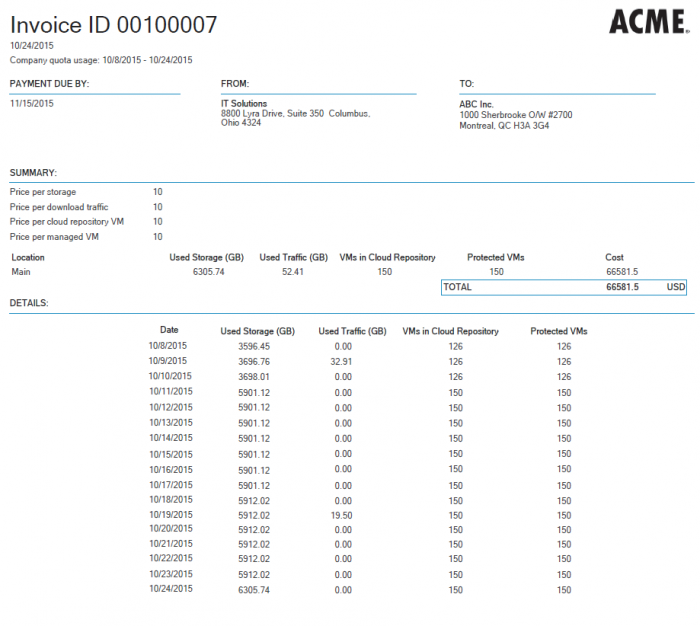 Invoices are shown for him as well, including whether he or she has already paid. Veeam Managed Backup Portal for Service Providers is fully integrated with your Veeam Cloud Connect infrastructure. Tenants that are created in the portal are visible in the Veeam Backup & Replication UI and an infrastructure is also visible and manageable from the portal. With no need for multiple users, the user account in Veeam Cloud Connect and the Veeam Managed Backup Portal are the same. Veeam Managed Backup Portal for Service Providers is a ready-to-use, single transport (no VPN needed) and fully integrated, with no need for a dual-management, service-provider dashboard. The Veeam Managed Backup Portal for Service Providers will be available in the Microsoft Azure Marketplace. 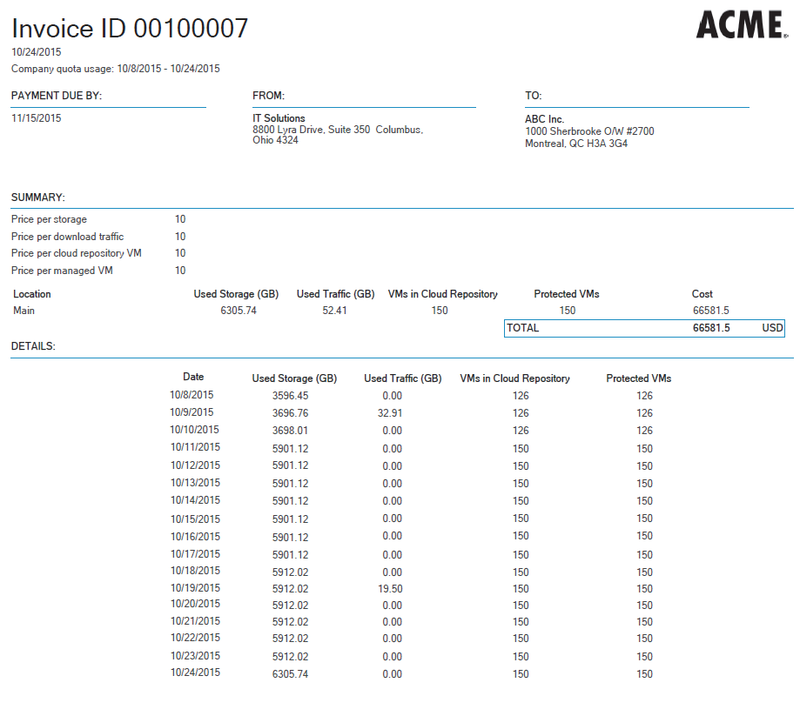 It integrates with Veeam Cloud Connect for Service Providers and requires Veeam Availability Suite v9. Simply deploy it through the Marketplace with no software to install. Partners, existing service providers and resellers that want to launch a service-provider solution or extend their business will benefit greatly from this new, innovative solution from Veeam Software. By removing issues such as the lack of resources, knowledge and upfront investments, the Veeam Managed Backup Portal for Service Providers will deliver new ways of remote management and monitoring of your customers’ data protection infrastructure, including multi-tenancy, easy onboarding, no VPN requirements and billing out-of-the-box. Read the official announcement! Coming to you from VeeamON 2015 in Las Vegas.